In 1944, during World War II, Japan launched a top secret project, nearly two years in the making, to send thousands of "balloon bombs" (called Fu-Go Weapons) to the United States. The goal of the attack was to create panic, forest fires, and show the United States that it could be attacked from afar. Each of the more than 9,000 balloon bombs launched towards the United States, over the course of several months, carried a 15 kilogram bomb that would detach from the balloon and explode on impact with the ground. On November 3, 1944, Japan launched its first series of Fu-Go Weapon balloon bombs as a way of "invading" the US from afar and creating havoc among its citizens and government.. It was meant to be "revenge" for the Doolittle raids on Japan. The balloons weren't designed to navigate themselves and that's part of the wonder of this Japans offensive. The ballons would rise to the sky, from the beaches of Japan, and follow the Jet Stream all the way to the United States. From the time the balloons were launched, it would take 3-4 days to reach the United States. About 1,000 of the more than 9,000 balloons actually reached the United States or Canada. The rest are believed to have failed during their journey, falling into the ocean. The United States government went to extraordinary measures to keep information on the Japanese balloon bombs out of the media. The United States knew that Japan could only measure its success based on media reports. And giving them that type of intelligence information could cause them to refine the balloons to be more accurate and deadly. To date, the majority of Americans still don't know about the balloon bomb attacks. The attacks are most known about in Oregon because five children and one adult were killed when they found a balloon in the forest and tried to pull it out, triggering the unexploded bomb. A memorial was set up for them where the incident took place. It is the only known deaths from the attacks. 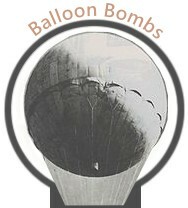 This Website has been designed to provide you with more information and insight into the Japanese balloon bomb attacks. ©2008 - all aritcles and material on this Website are copyright and may not be reused, republished, or rewritten.